Re-gain access to your valuable Excel worksheets and workbooks that were protected by an Excel 2007 or 2010 program. Also remove the protection of any regularly protected VBA project!... 27/12/2005 · Re: Excel sheet & VBA project password protection Originally posted by sato If the security in Excel is this bad, where anyone can just pay less than $30 to break the protection, I will need to approach my IT friend to compile the code as add-in, or dll files. Excel Password Remover removes the password protection applied by the “Protect sheet” and “Protect workbook” commands in Excel (i.e. enables you to edit the workbook even if you have forgotten your password).... How to unlock VBA password in excel 2003, 2007, 2010, 2013 and 2016? Are you also looking for a solution to break VBA project password from excel file? But do not know, how to perform this conversion. So, read this blog in detail to unlock password protected VBA code in Excel. 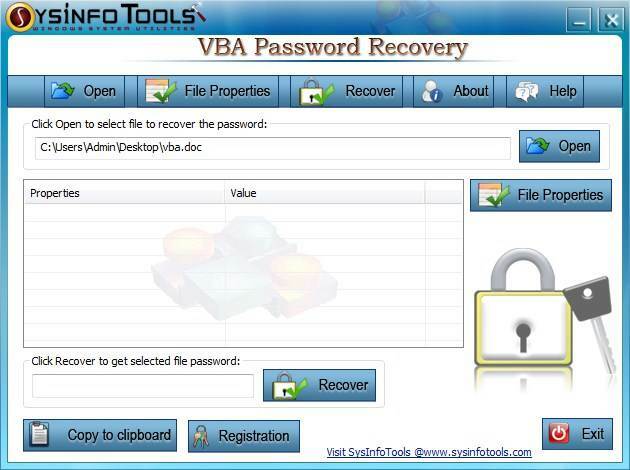 26/09/2017 · Try VBA Password Recovery Software that quickly recovers lost or forgotten passwords to all types of documents with Visual Basic for Applications (VBA) code. The program supports all applications of the MS Office suite (Excel, Word, Outlook, PowerPoint and Access), Corel Word Perfect Office and others that use VBA. 13/12/2013 · A VBA project password can be removed with a hex editor. Close the workbook and open the workbook file in the hex editor. Find the string "DPB" and change it to "DPx". 18/10/2017 · Explore the ways to Unlock VBA Project Password Excel 2010 & 2013 documents. Go through the article and perform the steps carefully to remove VBA Excel .xls file. Go through the article and perform the steps carefully to remove VBA Excel .xls file. 25/11/2015 · November 25, 2015 Password Recovery crack vba, How to recover password, PAssword Recovery Software, VBA password recover manually, VBA Password Recovery poonamrblog VBA stands for Visual Basic for Application , which is a component of MS Office and used by the MS application like Excel, Word, Access, etc.